Folke, C., J. M. Anderies, L. Gunderson and M. A. Janssen 2012. An uncommon scholar of the commons. Ecology and Society 17(2): 31. We wish to dedicate this midyear editorial and issue of Ecology and Society to Elinor (Lin) Ostrom who died 12 June from pancreatic cancer at the age of 78 years. Lin was a pioneer in many ways and was incredibly impressive in breaking through many barriers on her way to a remarkable set of life achievements. A true pioneer in interdisciplinary science for sustainability, she worked in a robust and systematic fashion with a deep and burning commitment for progressing knowledge and understanding. One major lesson from Lin was that complex problems require complex solutions, and that people can solve such conundrums. Moreover, those solutions are attainable. She used grounded scholarship that required lots of hard work to show why simple models such as overblown bureaucracies or moral prescriptions were not solutions to resource issues such as a tragedy of the commons. Pioneers always have a hard time with the conventional. Lin struggled without losing vision or focus, tirelessly and with deep commitment. She clearly demonstrated that we have to move beyond the conventional to capture the essence of institutions and social-ecological systems and how they relate to stewardship of natural resources and ecosystems for human well-being and societal development. Inspired by her contributions, many scholars and decision makers acknowledge the necessity of moving beyond simple solutions in navigating a globally interconnected social-ecological world. Society increasingly demands such an understanding, and research councils encourage such pathways while many universities are still struggling to move beyond the conventional. Lin contributed solutions to many problem areas with new insights on topics ranging from the effectiveness of urban police departments to the management of groundwater basins, irrigation systems, pasture lands, forests, and fisheries. 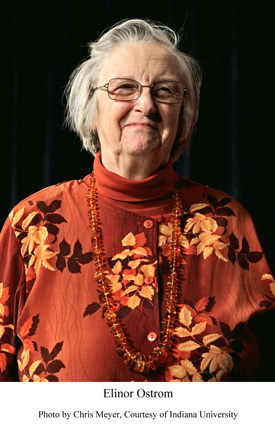 She was instrumental in the development of the International Association for the Study of the Commons, and her work on common pool resource management has been truly influential with the well-known 1990 book Governing the Commons: the Evolution of Institutions for Collective Action as a prominent example of her numerous publications; she was also the author of hundreds of articles and chapters and more than two dozen books! Her work countered the conventional wisdom that only private ownership or top-down regulation could prevent a “tragedy of the commons,” in which users would inevitably destroy the resources that they held in common. Through an interdisciplinary approach that combined theory, field studies, and laboratory experiments, she demonstrated that people are capable of creating rules-in-use, institutions that allow for the sustainable and equitable management of shared natural resources. In parallel with her groundbreaking work on the diversity of institutions for effectively solving commons dilemmas summarized in her 2005 book Understanding Institutional Diversity, Lin worked very hard to extend the theoretical framework she had developed to study social processes to better bridge the social and ecological sciences. She expanded her institutional analysis and development (IAD) framework to create a more prominent role for natural science knowledge and developed a general framework for analyzing sustainability of social-ecological systems or the SES Framework in short (Ostrom 2009). These were exciting times for many of us working with social-ecological systems. She understood the limitations of conventional scientific approaches to complex problems and advocated a diagnostic approach, based on an analogy from medicine (Ostrom 2007). Medical professionals are faced with problem solving for the dizzyingly complex system of the human body. Often, medical professionals cannot study this complexity before they take action, they must rely on heuristics guided by a diagnostic framework. The diagnostic framework developed by Lin provides a significant way forward for action regarding SESs. Although trained as a social scientist, Lin was willing to tackle problems with a diversity of qualitative and quantitative methods from disciplines across the sciences. The research question determined which methods would be most appropriate. She embraced emerging, challenging concepts such as complex adaptive systems to conceptualize and study self-organizing SESs (Ostrom 1999). Given her systems approach, Lin contributed significantly to understanding system-level properties of SESs such as resilience, robustness, and adaptive capacity. In her early work, she focused on which institutional and biophysical factors enable successful collective action responses to commons dilemmas. In later work, Lin began to focus on combinations of these factors that not only enable SESs to deal with a given, fixed set of governance challenges, but also enable SESs to respond when the set of challenges changes over time. Her work in this area has set the foundation for research in how to design adaptive governance regimes to promote resilience, robustness, and adaptive capacity in SESs. As a result of a lifetime of pioneering perseverance she was the first woman to be awarded the Nobel Prize in Economic Sciences. Her award in 2009 was “for her analysis of economic governance, especially the commons” and her groundbreaking research on the ways that people organize themselves to manage resources. In April 2012, she was named to the TIME 100, TIME Magazine’s annual list of the 100 most influential people in the world. She received numerous international awards, including honorary doctorates from universities in India, France, Germany, Sweden, Canada, the Netherlands, Switzerland, Norway, and the United States, and was a member of the American Academy of Arts and Sciences, the U.S. National Academy of Sciences, and the American Philosophical Society. Lin’s cooperative spirit and enthusiasm, and her intellectual sharpness combined with curiosity and excitement about new ideas was simply unique. She inspired, interacted, and collaborated with numerous colleagues throughout the world and her true interest and engagement with young people supporting their pathways was exemplary. Lin was deeply engaged in collaborative research on social-ecological systems and resilience thinking, excited about learning and rethinking earlier views, expanding frameworks, and understanding across the sciences, always open for new findings and thinking. It was never about defending turf. It was about collaboration and grounded scholarship for a deeper understanding of social-ecological systems, such a contrast to many. She joined early on with critical involvement in various phases of the Resilience Alliance and she has been engaged with Ecology and Society for many years, working with manuscripts and special features and helping us in securing the quality of the journal. Numerous papers published in this journal are inspired by Lin’s work and will continue to be. It has been an immense privilege and great pleasure for us to have had Lin as a close colleague for well over two decades, developing deep friendship and trust. She supported our diverse interdisciplinary efforts and platforms throughout the years, actively contributing and performing. Her imprint will continue to inspire, influence, and guide researchers and decision makers worldwide. The first two issues cover an amazing diversity of topics in relation to complex social-ecological systems, institutions, and resilience. In addition to the papers of the many special features (see below) the contributions deal with water resources, fisheries, forests, agrodiversity and urban biodiversity, rangelands, and climate change. Authors analyze governance challenges in relation to these resource systems, including agency, power and conflict, social capital and network features and processes, bridging organizations, social learning and participatory approaches, traditional knowledge and management systems, poverty traps, institutional dynamics, legal rules, scale issues, and the problem of fit. Economic dimensions are also investigated such as benefit sharing and decentralization. Many of the contributions explicitly address resilience, adaptability, and transformability, cornerstones of resilience thinking, including the interplay between periods of rapid and gradual changes, dynamics, traps, and transitions in social-ecological systems. Energy issues and geoengineering are also on the table and there is a piece on science and art – we love that! The journal continues to publish collaborative and interdisciplinary research in the form of special features that address pressing environmental issues of our times. The journal closed three features in March; Local Social and Environmental Impacts of Biofuels; The Energy-Water Nexus: Managing the Links between Energy and Water for a Sustainable Future; and Implementing Participatory Water Management: Recent Advances in Theory, Practice, and Evaluation. With this June issue, we close another, Balancing Ecology and Community using Cumulative Effects Models. Another 14 special features are in progress and dominate the home page of the journal. The topics range from urban social-ecological research to forest governance to mental models, and we invite the reader to explore the manifold lessons embedded in the collective contributions and individual articles. In the springtime, the Associate Editor-in-Chief, Marco Janssen, coordinated the Ralf Yorque Memorial Competition for “most novel paper that integrates different streams of science to assess fundamental questions in the ecological, political, and social foundations for sustainable social-ecological systems.” The subject editors of the journal voted and selected the paper by Jan Sendzimir, Chris Reij, and Piotr Magnuszewski, titled Rebuilding Resilience in the Sahel: Regreening in the Maradi and Zinder Regions of Niger as the winner this year. We congratulate the authors for their contribution and for their donation of the prize money to groups in the village of Dan Saga in the Aqui region of Niger, who work to protect and manage natural resources. Although insufficient, we take time again to thank all of those whose efforts contribute to Ecology and Society. We express our deep gratitude to the dedicated subject editors, and also guest editors, and all the reviewers who give of their precious time to support this work and help us sustain academic quality, curiosity, and problem-oriented work on integrative science for resilience and sustainability. We appreciate the fiscal and administrative support from the Resilience Alliance. Finally, we would like to thank the staff, Adele Mullie, Jennifer Miner, and Jennifer Mullie, who have managed the day-to-day operations and make sure that the machinery of the journal is smoothly ticking along. Thanks! Ostrom, E. 1990. Governing the commons: the evolution of institutions for collective action. Cambridge University Press, Cambridge, UK.